The private villa with pool is located near Arezzo at 550 m above sea level. The villa can accommodate 8 +4 people in 4 bedrooms and 4 bathrooms. The villa is located in a secluded olive groves and oak forests to 8 km from the town of Cortona. It was originally an ancient Tuscan farmhouse built in the first half of 1800. You reach the villa by a small dirt road about 5 km long. The features are those rustic Tuscan architecture, built with different materials that were easily found in the area. The renovation completed in 2001, it has maintained its identity while equipping the house with all the amenities. Villa with pool is part of a small outbuilding. The magnificent garden with swimming pool 10 x 5 meters is in a panoramic position, guests have the stone barbecue and a large table for 12 people. From the swimming pool you can enjoy a splendid view of the Tuscan countryside. 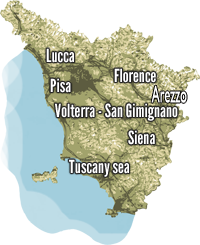 A short drive away are within Arezzo, Cortona, Montepulciano and many other cities of Tuscany and Umbria. Ground floor. Extensive fully equipped kitchen with electric oven, refrigerator, dishwasher, stove, living room with sofa bed, satellite TV and DVD, hi-fi, telephone, wi-fi, bathroom with shower, laundry area. First floor through an inner staircase leads to the bedroom where there is a double bedroom with bathroom with bath and shower, a double bedroom with bathroom with shower, a bedroom with a loft for a total of 4 beds and bathroom with shower. Depandance. A double bedroom and bathroom with shower. The total price includes: VAT, electricity, gas, water, bed linen and towels, use of swimming pool, weekly change of bed linen and towels final cleaning, heating.